1. Heat the oil in a large frying pan and cook the onion and garlic for 5 minutes until softened. Stir in the cumin and cook for a further minute. 2. Preheat the oven to 200ºC, gas mark 6. Pat the beetroot dry on kitchen paper and roughly chop. Place in a food processor with the onion mixture, chickpeas, breadcrumbs and egg. Whizz together to make a firm paste. 3. Using damp hands, roll the mixture into 20 even-sized balls and place on a non-stick baking sheet. Brush lightly with oil and bake for 20–25 minutes until crisp and heated through. 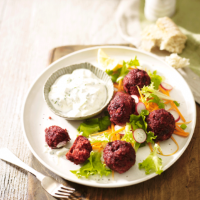 Serve warm with tzatziki and mixed salad. These will keep for 2 days in the fridge, and are just as good eaten cold as leftovers. They make a great packed lunch.